I’ve never had the desire to read The Art of War, the ancient Chinese how-to war manual written by Sun Tsu. It seems like something only military historians or the Michael Douglas character in Wall Street would be interested in. 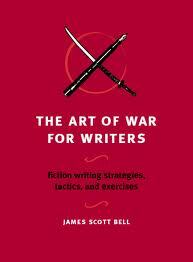 But when I saw the cover of The Art of War for Writers, by James Scott Bell, I was drawn to it. No doubt this was partly due to the bright red color and the cover image of a fountain pen crossed with a ninja sword. (We know which one is mightier, right?) But I was also attracted by its implied messages of strategy and strength. I admit it. Sometimes, as a writer, I‘m a total wuss. My psychological armor is rusty, I have no eye of the tiger, and my battle plans usually involve ingesting a rather unhealthy amount of chocolate and then taking a nap. 3. Strategy: how to move confidently through the tricky world of publishing. Bell makes it clear that this book is “not a comprehensive ‘how-to’ on fiction.” (He has written two other books—Plot & Structure and Revision & Self-Editing—for that). Indeed, this book offers the kind of advice you’d want to get if you were paying for it by the word—short, to the point, and tremendously valuable. It’s great reading cover-to-cover, but it’s also a book to pick up for specific advice at various points during the writing process. This is a fun book, a helpful book, indeed a “field manual for all writing wretches.” I am one of those wretches, and I’m grateful that this book has sharpened my mental ninja-writing-sword. Do you have a battle plan for writing? That sounds like a book I should read, Jenny. My battle plan? Uh...I don't think I have one.